Centrioleí¹‚í°¦lt;br>A cylinder-shaped organelle composed of microtubules and found in the nucleus of a cell. During nuclear division it forms the spindle, which ensures that the duplicated chromosomes are equally divided between the daughter cells. Resembles a basal body in structure. Centrioles are not found in plant cells. Chromatiní¹‚í°¦lt;br>The tangled fibrous complex of DNA and protein within a eukaryotic nucleus. Cytosolí¹‚í°¦lt;br>The fluid portion of a cell's cytoplasm. Golgi Apparatusí¹‚í°¦lt;br>A cellular organelle of the cytoplasmic membrane. It is covered with cisternae and is involved in secretory processes. Microtubulesí¹‚í°¦lt;br>Thin tubes made up of protein that are used to make structures involved in cellular movement such as flagella. 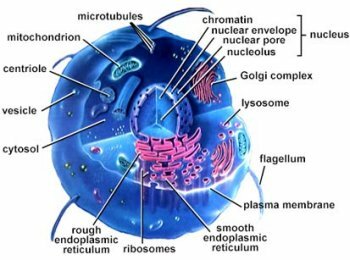 Nucleolusí¹‚í°¦lt;br>A dense, roughly spherical body found within the nucleus of a eukaryotic cell. Plasma Membraneí¹‚í°¦lt;br>The membrane that surrounds a cell's cytoplasm, separating it from the environment. It consists of a double layer of phospholipids and has proteins embedded in it. Rough Endoplasmic Reticulumí¹‚í°¦lt;br>A type of endoplasmic reticulum, an organelle found in eukaryotic cells, which has a large number of ribosomes attached all over it. It is important to the making of proteins and in preparing secretions of the cell. Smooth Endoplasmic Reticulumí¹‚í°¦lt;br>A type of endoplasmic reticulum, an organelle found in eukaryotic cells, which plays an important role in the making of steroid hormones. cell membrane material and is formed by pinching off part of the cell membrane. Vesicles contain particles which the cell is importing ( endocytosis), or waste products and secretions which the cell is exporting (exocytosis).